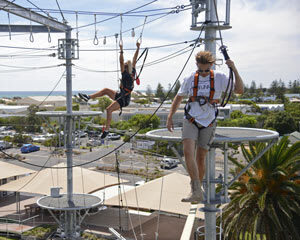 Mega Adventure Skychallenge! 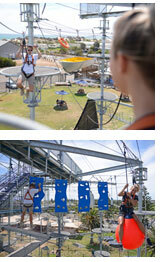 Our aerial structure takes adventure to a whole new level of fun. Our aerial structure takes adventure to a whole new level of fun. Imagine playing tennis in the sky, rowing a boat mid-air or manoeuvring between obstacles like our floating esky, BMX bike and sky-high picnic table? And, for those who are up for the ultimate challenge you can take a leap of faith from our ParaJump – all in the safety of our world-class harness. The Access all Areas pass gives you free reign to explore over 50 obstacle crossings on the entire SkyMate structure, lets you take the ultimate plunge from the ParaJump, and enjoy the arresting views from the SkyWalk.